Wandahome was established in 1951 in Stanningley Road, Leeds by Ernest Jones Burnley, who conceived the Wandahome Dawn, a hand built touring caravan frame that could then be customised to a customers exact specification. Under the stewardship of the founder's grandson, Steven, the company has prospered and today is one of the most successful caravan and motorhome retailers in the country. Continuing success has been achieved through a determination to ensure total customer satisfaction that sees many customers coming back year after year. In 2013 Wandahome acquired Waudbys Outdoor Leisure. Wandahome at Waudbys web site offers 1000's of items at very low prices. 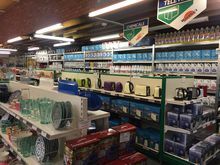 Alternatively why not come and have a leisurely browse in our extensively stocked showroom where friendly helpful staff will be on hand and thousands of caravan,camping, leisure and marine accessories are on show. 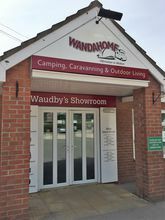 If there is anything Waudbys can do to assist or help in any way please e-mail us direct at shop@waudbys.co.uk or telephone 01430 422523 where someone will be available to offer advice on any product or spare part available in the caravan and camping world.